Osciloscopio digital de última generación con analizador lógico de 16 canales y pantalla TFT retroiluminada en color de alta resolución de 8 pulgadas. La interfaz USB le permite transferir grandes cantidades de datos rápidamente. Almacena datos directamente en una memoria flash USB. Es particularmente adecuado para el análisis de señales analógicas y digitales complejas. 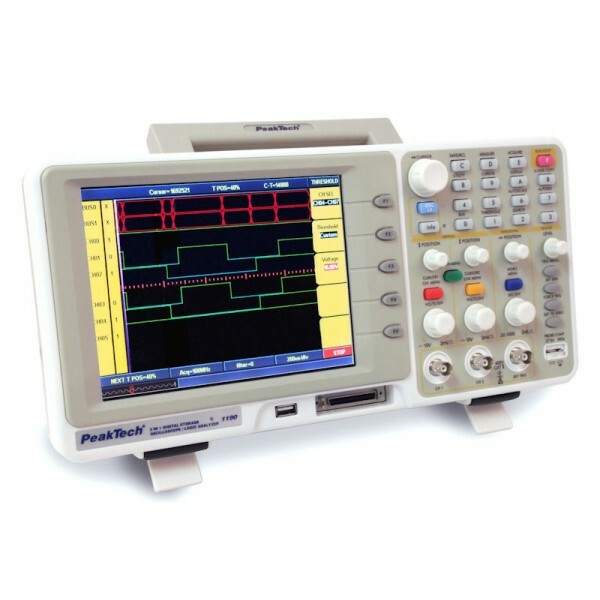 100 MHz Digital storage oscilloscope of the latest generation with 16 CH logic analyzer and 7,8” TFT color display, high resolution, backlight and USB function benefits faster and larger data communication. The current electronic products become more complicated as the number of digital circuits and universal serial bus increase; the testing signal often mixed by analog and digital signal so the engineer would like to get than test instrument could test both the analog and digital signals. Provides versatile applications for educations, training centers, repair and maintenance and satisfies increasing needs of higher performance. Time base 5 ns - 100 s/div. Digital Filter 0, 1, 2 opt.